Giveaway ends February 06, 2018. It always seems more interesting to challenge conventional notions of right and wrong than to present clear black and white. For example, Star Wars (episodes 4-6) is the most perfect cinematic experience ever, in my opinion. You gotta admit, it would not be as good if Darth Vader were a pure villain. In Rapture, none of the main characters are 100% good or bad. To what extent are people willing to pursue what they think is right, especially when that entails doing ugly things? Really ugly things. What if the price of humanity is inhumanity? Our moral weather, after all, is usually clouded by shades of gray. More than fifty. Speaking of Fifty ... Romance didn't make it into Rapture. I like love stories, but after my first novel, I was weary of writing about romance. Book revision can be a treadmill. 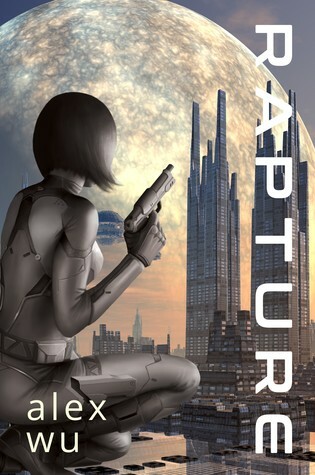 To get off it, I aimed to publish Rapture by the end of 2017. The book came out on December 28, 2017. Pushing that publishing button was hard. It wasn't a big button, unlike those accessible by certain world leaders. Still, I hate clicking buttons such as "Send," "Submit," or "Place Your Order"—basically anything with a whiff of finality to it. I'm always afraid that if I try to order 2 bags of Cheetos online, I might mistakenly order 2,000 pounds of Chia seeds instead. But I pressed the button. Movin' on. Alex, the cover is *kisses fingers* PERFECT! Congratulations on making it by the skin of your...big toe getting RAPTURE into the world in '17! I'm so proud of you for pressing that button. HUZZAH! You are, as always, too kind to me. Thank you for your beta read - the book benefited a lot from your honest input. I will share my bitcoins with you and name my firstborn after you. And I miss talking to you.